Use Memo to write and save notes on your device. 1. From a Home screen, tap Apps > Memo. 2. Tap Create memo and type a memo. • To change the category, tap Category. • Edit: Select notes to delete or move. • Manage categories: Create and manage categories to organize your memos. • To insert an image into the memo, tapImage. • To use your voice to insert text into the memo,tap Voice. • To add tasks, tap Tasks. 3. When finished creating your memo, tap SAVE. 2. Tap a memo to view it. 3. Tap the content and make edits. When you are finished, tap SAVE. ► From a Home screen, tap Apps > Memo. • Browse memo entries by swiping up or down. 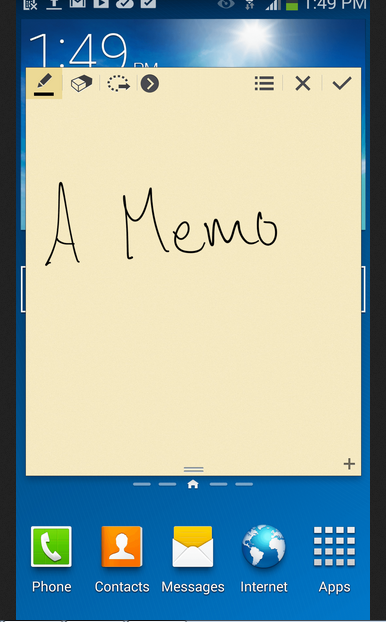 • To search for a memo, tap SEARCH.